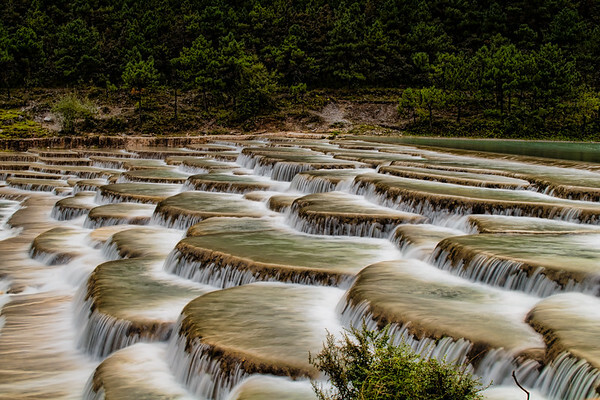 This is a Sacred Buddhist waterfall （美丽雪山神瀑) near Yubeng, Yunnan, China. 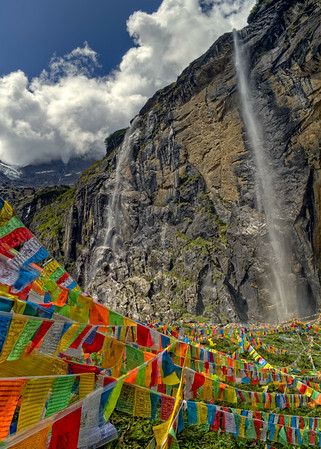 It is an amazing place with Tibetan prayer flags everywhere and this massive waterfall with fresh water from the snow topped Meili mountain. 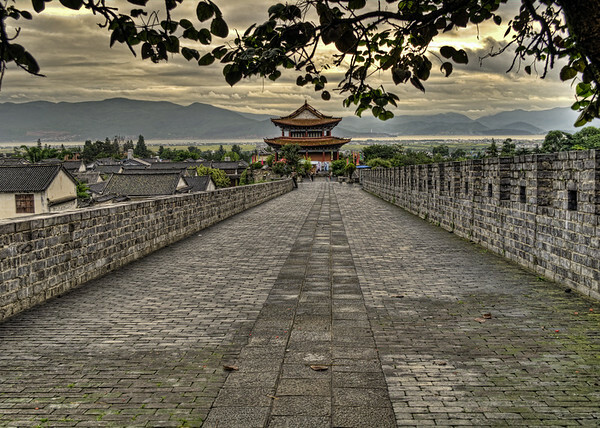 Dali is surrounded by a city wall and next to a lake that you can see in the distance. I took this one from the top of the city wall. We biked down to the lake later in the day. 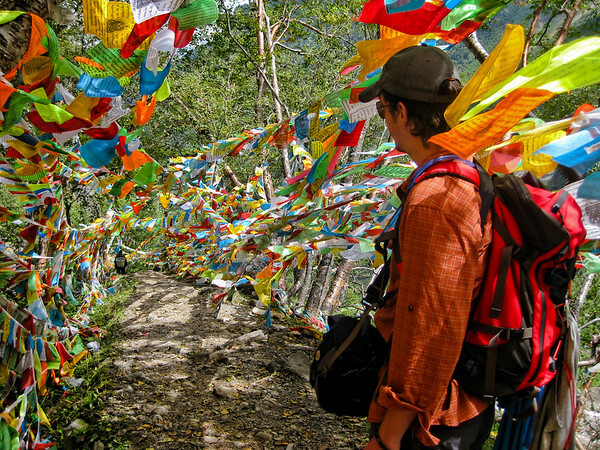 The trail to the sacred waterfall near Yubeng in the Meili Mountain range is lined with prayer flags. 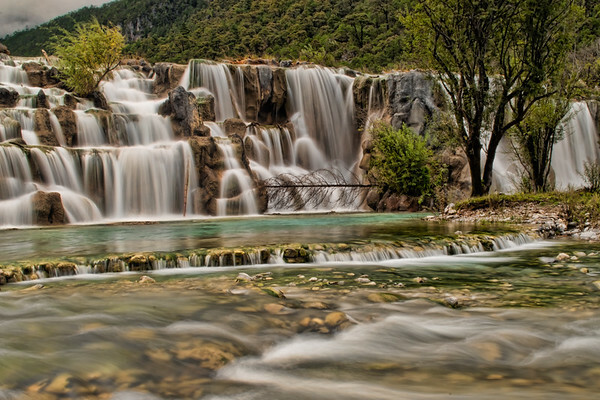 This is one of the most sacred places for Tibetan Buddhists and many make the pilgrimage to the waterfall each year. Underneath a waterfall we saw a rainbow around the sun. 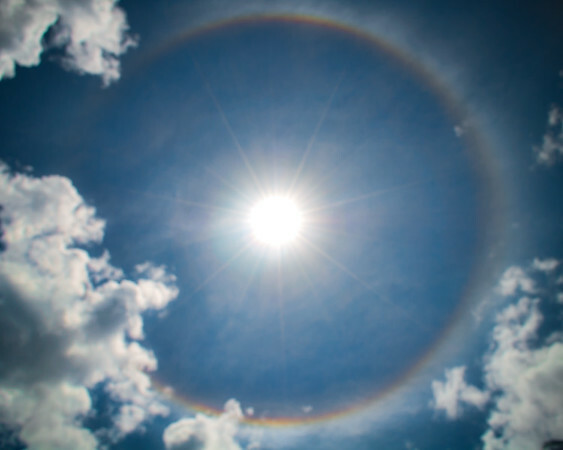 The mist from the waterfall created a complete circle rainbow, it was quite the sight to see. 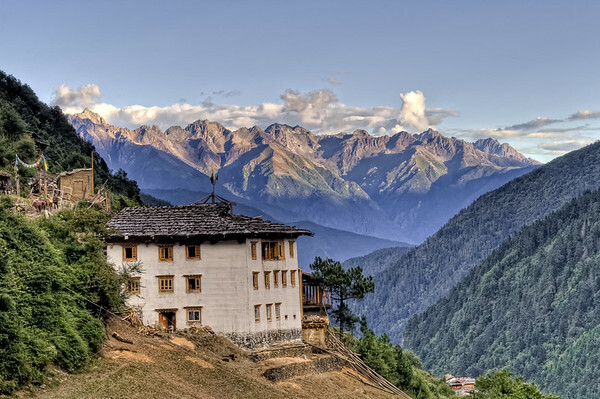 This house sits on the side of the mountain in upper Yubeng, and overlooks the valley to lower Yubeng. The owners have a pretty impressive view while having their morning tea. Upper Yubeng consists of these houses and a couple more behind me. The school is in the top right. 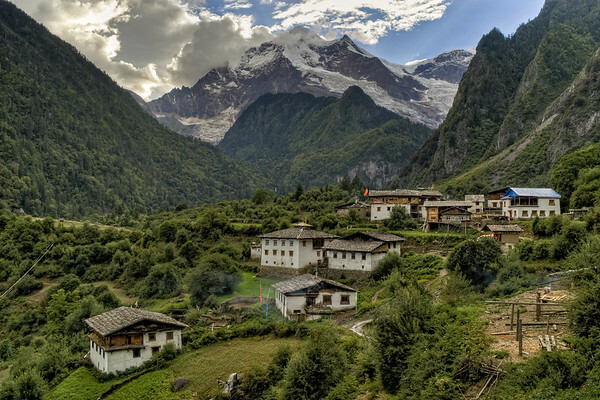 Currently, it is still underdeveloped but with a major upgrade to the road to the Meili Mountain area to be finished in the summer of 2011, more tourist dollars should flow through Yubeng and it will become more developed. 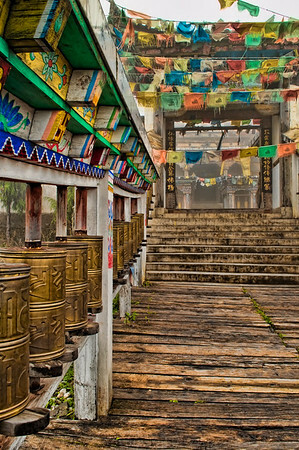 Beyond this abandoned Tibetan style house on the path to the left leads to a sacred site for for Tibetan Buddhists. 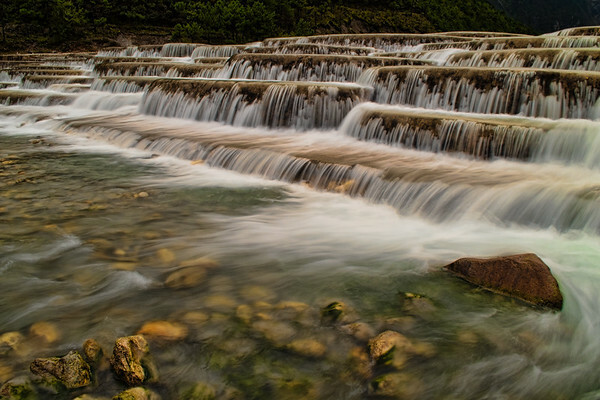 The trail follows the mountains to the left and ends at an impressive waterfall created from the melting snow from the sacred mountain of Kawagebo. 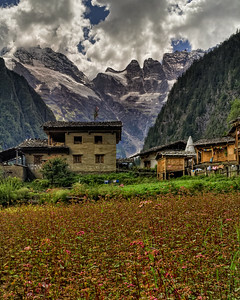 Lower Yubeng consists of about ten homes of farmers but most also open their homes as hotels. They aren?t much but they drink from the clean cold water of the Meili Mountain tops and live in a beautiful valley. 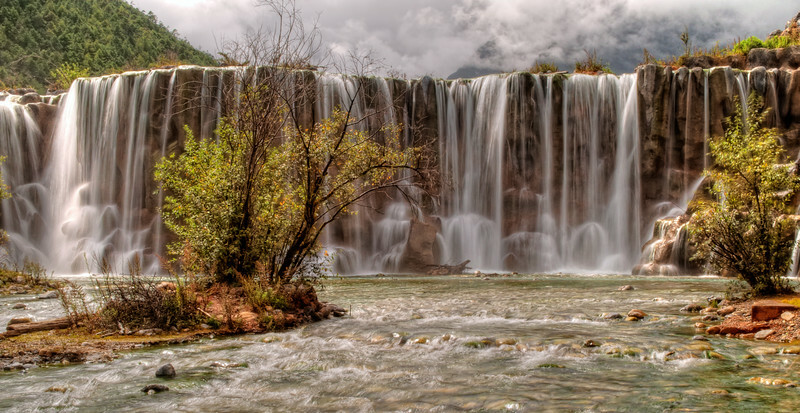 These falls were pretty impressive and a main scenic point in the Yulong snow mountain park. Yulong Snow Mountain is just north of Lijiang and doesn’t feel like what most thing of China. It is a similar landscape to the rocky mountains in North America, and just as beautiful. 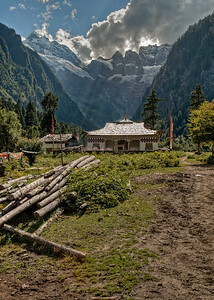 Entrance to a small temple at Yak Meadow. When we arrived the temple was surrounded by fog and had an eerie feel to it. Very peaceful place. 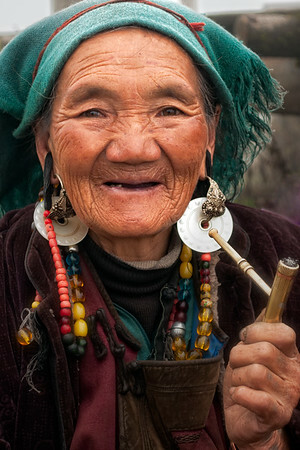 This woman was hanging out at the trail side at Yak Meadow in Yulong mountain park. She was kind enough to let me take her photo. Unfortunatly, she couldn't speak Manderin so I wasn't able to chat with her, which would have been even better. 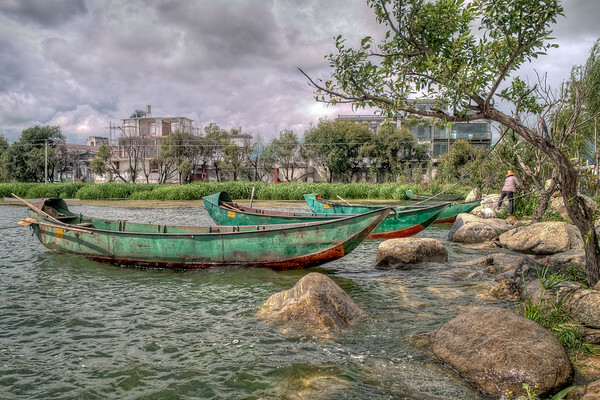 Found these boats next to a small village alongside Erhai lake. The owners offered to take us out for a ride but we were happy to snap a couple of photos and get back on our bikes to continue down the road.